Actually this isn't a recipe more how to get a great dessert on the table in less than 25 minutes counting baking time! Of course if you prefer to make everything from scratch these will take longer. All I can say is with a few ingredients your going to love these fresh blueberry turnovers and so will any other blueberry lover. Are you ready lets get started with this easy to make dessert! Take the pie crust and unroll the circle. Place the berries in the middle add the jam, fold over and crimp the edges. Sprinkle the top with sugar. Bake in a 350 degree preheated oven on greased cookie sheet. For easier clean up use foil sprayed with cooking oil, parchment paper or a silpat mat. They all work except don't use wax paper it sticks and smokes in the oven causing a bad taste and odor. Now after the 25 to 35 minutes are done check to see if the top is browned nicely. Remove from the oven and while still warm drizzle some vanilla frosting over the top. That's it. Good luck trying to keep these around they were gone and I made six of them the first night! 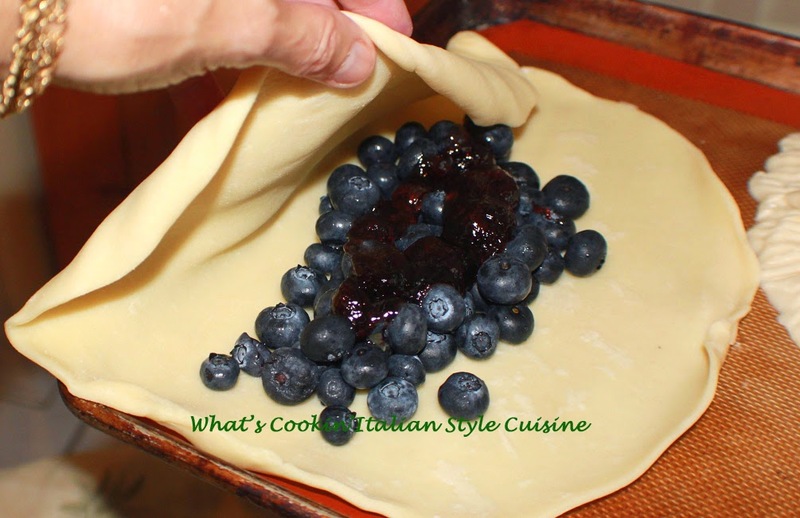 If you prefer to make your own pie crust see the link below for recipes. I love anything blueberry and I'm not surprised these were gone in the blink of an eye. I hope all is well and you are enjoying the summer and your beautiful grandchild. This just sings to my berry-loving heart. I bet these are perfect with any berries! Of course they went right away.